Linked open data methodologies have an important role to play in the future of archival description. With this in mind, I am moving EADitor and xEAC further in this direction. Both frameworks already support serialization of EAD or EAC-CPF into RDF. xEAC supports three different RDF models, in fact, depending on which community the data are intended to serve. EADitor transforms EAD finding aids into the Arch ontology. There are no true standards yet for representing archival resources as RDF, but I am hopeful that some will emerge. Since EADitor is now capable of embedding xEAC URIs for archival entities into EAD finding aids, the next step in linking resources together is the implementation of an RDF triplestore and SPARQL endpoint into both xEAC and EADitor. EAC-CPF records two primary types of relations: links to other corporate, personal, or familial entities in the form of CPF Relations and Resource Relations, or links to other resources by or about an entity that may be available on the web. It makes a lot of sense to me to store CPF relations within the EAC-CPF record, especially if these related entities are stored in the same information system (like xEAC). On the other hand, I don't think it makes sense to store resource relations within the EAC, mainly because I think that it's far too complicated to maintain a growing list of relationships. Let's suppose you have an entity, Thomas Jefferson, defined by a URI, http://example.org/thomas_jefferson. A significant portion of his collection is contained at the University of Virginia and Monticello, but he corresponded with many of his other contemporaries. Therefore, the papers of John Adams or George Washington may also contain letters from Jefferson. He also corresponded with numerous prominent Europeans, so some of his materials may be contained in archives overseas. There may be dozens or hundreds of institutions which contain at least one article by or about Jefferson. If each of these archives adopts a stable URI that defines Jefferson, then it is much easier to accept RDF derived from EAD, MODS, or a relational database into an RDF triplestore, and use SPARQL to gather these materials dynamically from the triplestore when a researcher accesses the http://example.org/thomas_jefferson entity record. This is the approach that I am implementing in xEAC and EADitor. For example, if the <origination> within the <did> of a finding aid (or individual component) contains an entity URI, the RDF derivative of the finding aid will link the archival resource to the archival entity through the dcterms:creator property. In EADitor, once the SPARQL endpoint URLs for querying, publishing, and updating data have been established, the RDF will be posted into the triplestore when the finding aid has been designated for publication on the web. Likewise, if these endpoint URLs have been added into the xEAC configuration file, the XSLT template for generating HTML from EAC-CPF will query the SPARQL endpoint to list related resources that have been pushed into the triplestore from EADitor. Furthermore, EADitor itself isn't necessary for this functionality in xEAC. RDF may be pushed into the triplestore by other means--from an institutional repository, from ArchivesSpace, or something else. You could even feed data from Europeana into a triplestore to build a prosopography of Impressionistic artists. The sky is the limit. There is still work to be done in the UI, but the underlying technological functionality is now available in the Github repository for both applications. 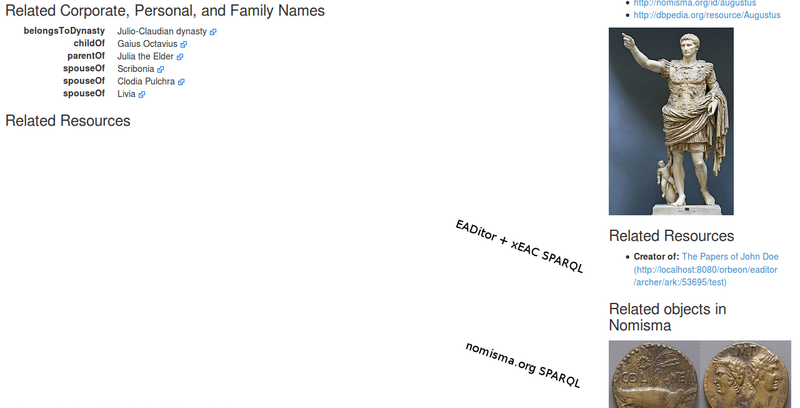 The functionality for linking EADitor and xEAC to SPARQL endpoints is identical in both applications. The URLs are added through the Settings page. Under the SPARQL heading, the user clicks the "Connect" button, which launches a popup window requiring the user to input three separate URLs: the query URL, the Graph Store URL, and the SPARQL/Update URL. These URLs may vary from application to application, especially if the configurations have been changed. Note that a SPARQL 1.1-compliant endpoint is required. After ending these URLs and clicking "Connect," the XForms engine will test each one individually. First, it will attempt a basic query. Then, it will post RDF into the Graph Store URL, and if successful, an XForms submission will be executed to delete the graph through SPARQL/Update. If all three processes complete successfully, the URLs will be added into the EADitor/xEAC config, and then the config can be saved. The user is also presented with the option to post all records that have been slated for publication (in Solr) into the RDF triplestore. From the admin page, when a user deletes a record from the eXist database or removes the record from publication, the triples will be purged from the endpoint as well as the docs being deleted from Solr. When a user publishes a record, the record will be serialized into RDF and posted into the triplestore in addition to the user Solr publication. Likewise, triples will be updated when the user saves a published record from the EAD/EAC-CPF editing pages. Ergo, enterprise archival linked open data publishing. There is still work to do here: the ontology and RDF data models still need work, which is more of a community effort. And of course, I have a lot of plans for enhancing the user experience. Once this new publication model is fully functional, I will begin SPARQL-based visualizations of social networks and relations between entities and their archival resources.